Kuala Lumpur (Malaysia) – September 27, 2017 (travelindex.com) – Former President James Alix Michel has been invited to address the 6th South China Sea Conference under the theme Forging a shared future in the South China Sea which will be held in conjunction with the Malaysia International Marine Expo (MIMEX) 2017 at the Putra World Trade Centre (PWTC) in Kuala Lumpur. The conference will deliberate on several complex and multi-layered issues in the South China Sea in an effort to seek to resolve them in a comprehensive, peaceful and enduring manner. For centuries, the South China Sea has been a strategically significant waterway not only for this region but globally. Its strategic position has given rise to much geopolitical manoeuvrings and led to various territorial and maritime disputes. The conference will discuss five important topics concerning the area, which is still seeing a number of territorial and maritime disputes. The issues to be focused on would be geopolitical changes and the involvement of major powers in the region, ASEAN regionalism, and the regional security order, Managing the maritime real estate: towards sustainable development in the South China Sea and promoting regional prosperity through appropriate development. 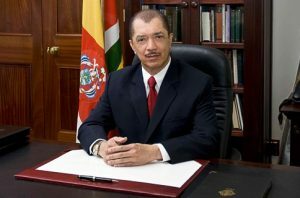 President Michel will deliver a special address during which he is expected to share with the conference the experiences of Seychelles in the management of its maritime assets with special emphasis on the sustainability of the oceans.The sustainability of our oceans will ensure the sustainability of our countries, which, in turn will ensure the sustainability of our planet. We have no other alternative said the former President. President Michel added that he was glad that Seychelles was leading the discourse on sustainability and the Blue Economy and that he was proud and privileged to be part of that process. President Michel will be accompanied at the Conference by the Chief Executive Officer of the James Michel Foundation, Mr. Jacquelin Dugasse. The theme of the conference, ‘Forging a Shared Future in the South China Sea’, has attracted experts on the subject from the United States, China, Japan, United Kingdom, ASEAN countries and Seychelles.